Almost five years after toxic sludge flooded Devecser, the town is thriving – but worries remain about similar industrial waste sites around Hungary. DEVECSER, Hungary | When a friend called Marton Ovari to tell him that a flood of red mud was overwhelming Devecser, a town of about 5,000 people in southwestern Hungary, he wasn’t alarmed at first. He knew the Torna creek, which flows through the town, often turned red as a result of leaks from a reservoir holding the caustic byproduct of aluminum production from a nearby plant. He took in a horrifying panorama. The reservoir had not leaked – it had burst its banks in what would become one of Hungary’s worst environmental disasters. 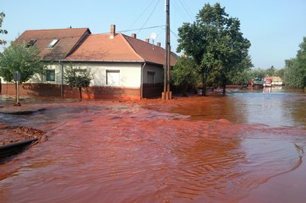 A virtual tsunami of red mud had invaded the towns of Kolontar, Devecser, Somlovasarhely, Somlojeno, Tuskevar, Apacatorna, and Kisberzseny, claiming 10 lives and seriously injuring more than 150 people. 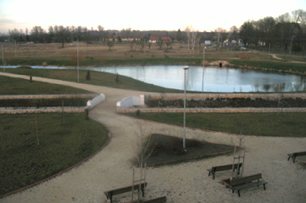 Nearly five years later, Devecser is a brand new town, with three man-made lakes and a memorial park. One recent construction project is Rotary Haz – the local home of Rotary International – which houses an exhibition on the disaster. Commenting on a video in the exhibition, curator and guide Boldizsar Zsolt said the cameraman stood in sludge up to his neck, not realizing it was toxic. “When he was taken to the hospital to be treated, his skin peeled off as the mud was being removed from his body. The nurses and doctors started to cry,” Zsolt said. 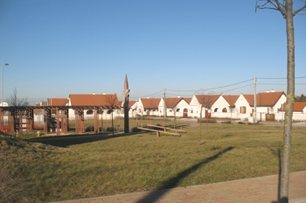 New housing and a memorial park make up the face of Devecser these days. Photos by Daniele Bassi. Nearly 100 new houses – funded by charitable donations and taxpayer funds – stand on land that was once a cornfield. No physical evidence of the tragedy remains. Still, the fear of another environmental disaster remains among the population, not only in Devecser but also around the three other smelting reservoirs that serve as a reminder of Hungary’s industrial heyday. The interwar discovery of vast reserves of bauxite, from which aluminum is produced, came just ahead of growing German military demand for aluminum during World War II. Afterward, when Hungary became a satellite state of the Soviet Union, extraction further increased. But by the time communism had begun collapsing across Central and Eastern Europe in the late 1980s and early 1990s, global demand for aluminum had plunged. The industry that once provided the country’s main commodity was on its deathbed. Privatization seemed the only option to save the national aluminum industry and address its long-ignored environmental issues. But the privatization contracts were vague on the issue of environmental responsibility and inspections were patchy. The dangerous red mud was left to build up for decades. In 2003, one of Hungary’s best-known environmental organizations, the Clear Air Action Group, tried to raise government and public awareness of the red mud, warning it could be dried and blown around by even modest winds. It also warned that a leak could contaminate the surrounding vegetation and the water supply. The red tide killed 10 people. Photo by Marton Ovari. Environmentalists say the red sludge reservoirs were a symptom of a larger problem. “Since 2006, regulatory authorities for industries such as mining have been getting weaker and weaker,” said Gergely Simon, a regional expert on toxic waste for Greenpeace Hungary, who cited budget cutting and a shrinking corps of inspectors. “They had hundreds and hundreds of cases and not many people to check on them,” he said, adding that permission to build new facilities was often granted automatically. Simon said the environmental protection authority failed to realize that there was too much highly alkaline water on top of the reservoir’s red mud layer. Attempts to reach officials in the Hungarian government’s Mining Bureau and local permitting office for comment were unsuccessful. Environmental groups and others charge, however, that MAL could have switched earlier to a safer but more expensive storage system that reduces much of the sludge to a solid, which it implemented after the disaster. About a week after the flood, the company was taken over by the government. Nearly a year later, it was fined 135 billion forints ($655.5 million), four times the estimated cost of cleaning up the area, building new houses, and covering other disaster-related expenses. The fine has yet to be paid. The company and its former managers have also been subject to criminal and civil proceedings. The Clean Air Action Group estimates that 30 million to 50 million tons of red mud are stored in four reservoirs like the one that burst. Environmental experts and scientists have cautioned that Almasfuzito, a village 50 miles northwest of Budapest and just south of the border between Hungary and Slovakia, could one day meet Devecser’s fate. Almasfuzito’s old aluminum smelter represented the country’s industrial potency during the Soviet days, but when it closed in 1997, it left not only the ghost of an industrial giant but also 5 million tons of caustic red mud. Months after the spill in Devecser, Greenpeace hired experts to analyze the remaining reservoirs. The team concluded (pdf) that the Almasfuzito reservoir was the most dangerous. In April 2012, the Geographical Institute of the Hungarian Academy of Sciences confirmed that the reservoir at Almasfuzito could pose a serious threat. Not only is the reservoir located in the most seismically active zone of Hungary, the report said, but contaminated waters present on the surface of the ponds could also mix with ground water and reach the Danube. A spokeswoman for Tatai Kornyezetvedelmi, the company that manages the site at Almasfuzito, agreed to comment on condition that the company be allowed to approve this article, which TOL refused. On its website Tatai Kornyezetvedelmi says it has developed a remediation process for red mud reservoir sites. According to the company (pdf), the compost generated through the process is similar to soil but is resistant to highly alkaline, metallic sludge and is gradually being used to cover the reservoir. Tatai Kornyezetvedelmi – which enjoys strong support from the Hungarian government – further states in its literature that the remediation technology has lowered the levels of pollution in the area. It says the surfaces that have been recultivated have integrated the area into the landscape and prevented the infiltration of rainwater into the red mud. However, the Tatai Kornyezetvedelmi remediation technology was singled out in the 2012 Geographical Institute report as untried and unpredictable. Greenpeace filed a European Commission complaint against Hungary in light of those findings, claiming that the composting process – as well as the permit the North Transdanubian Environmental Inspectorate had supplied – did not comply with several aspects of Hungarian and European Union law. The EU investigation is ongoing. Greenpeace has carried out random testing in the area affected by the 2010 red mud spill in Devecser and found that the pollution has subsided. Food harvested in the area seems to be safe. Greenpeace’s Simon agreed, though he said he believes the waste flushed is not as caustic as the mud that invaded the area in 2010. He said dealing with the waste generated from aluminum extraction, which is difficult to completely reuse, is challenging around the world, not just in Hungary. According to Benedek Javor, an environmentalist and member of the European Parliament, the definition of mining waste has been expanded in EU legislation. But he said other measures, including obligatory insurance to cover environmental damage for companies operating in the industry and the creation of an EU-level security fund for dangerous facilities funded by those facilities, would provide better safeguards. The chances of a similar disaster occurring remain high, Simon said, as liability problems remain unresolved and old industrial facilities and polluted sites remain neglected. “But nobody does anything, and the taxpayers will pay millions again,” he predicted. Daniele Bassi is a Brazilian-Italian freelance journalist who divides her time among Venice, Brighton, and Sao Paulo.